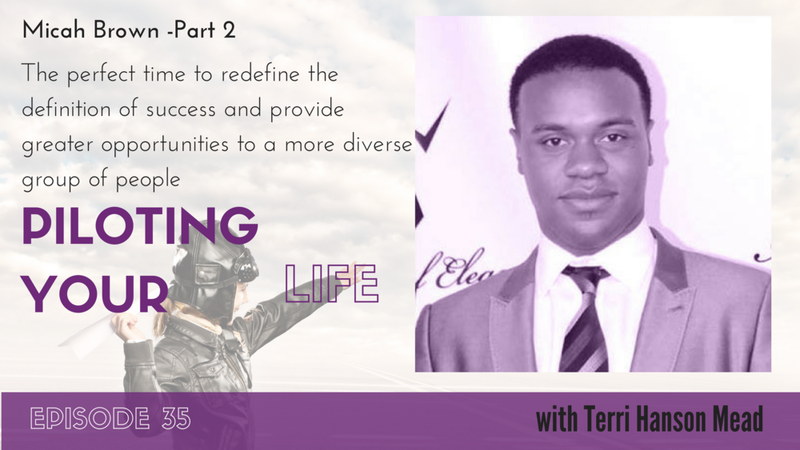 Terri talks with Micah Brown about now being the perfect time to redefine the definition of success and provide greater opportunities to a more diverse group of people. Terri talks to Micah Brown about his experience as a founder of color in New York City and how we can change the funding dynamics for founders of color and female founders and ultimately the definition of success. This is the second part of the interview that we abruptly cut off last week leaving you, hopefully, hanging on the edge of your seat for Micah’s experience with the diversity investor. Wait no more. Micah is a self-proclaimed visionary technologist with an intersection of skills consisting of data and algorithm understanding, HCI-centric digital technologies, financial services, financial engineering and media services. He has over 10 years of experience (up to the SVP level) across companies like Aon, Barclays, NBC and Viacom. Micah has a deep technological understanding and a strong commitment to social causes; at the center of Centiment and FilmFundr is the need to level the playing field in media for minorities. Micah talks about an experience with an investor with a diversity lens who led him to take a hard, corrective action. The investor said that Micah was example of a POC founder that should be invested in although he doesn’t actually invest in diversity. Micah points out some logic to the investor about his portfolio, the data around the startups in his portfolio, and then the data about the POC company in his portfolio which was beating out all the other companies in the portfolio. Micah points out the importance of deploying raw intellect with these investors to point out the flaws in the investors’ hypotheses to ultimately shift. Terri poses the question as to whether we are going to be able to get these primarily white male investors to shift in their investing or do we need to create a new ecosystem of funding. Micah talks about how difficult it is starting up a company and raising money and the difficulty for the investors to empathize with struggling founders of color. Micah talks about the difficulty in getting funding if you are a person of color because of the makeup of the current VCs. Micah talks about the importance of getting LPs to invest in funds that can create a new ecosystem of funding to invest in startups because right now saying that you invest with a diversity lens is PR and there is no substance behind it. Last year in NYC, there were 780 non-POC companies that got funding in 2017 and only 15. He talked about the importance of naming and shaming to raise awareness and begin to affect change. Terri talked about how Trump’s election triggered many people, including her, to no longer be complacent, and emphasized the need to speak up and take action. She was cautiously optimistic after the Justin Caldbeck scandal but then more optimistic after Harvey Weinstein and then the politicians in terms of we might be able to move the needle and move more quickly in leveling the playing field. Terri talks about the importance of getting LPs to invest not because it’s a diversity play, but because it’s a good business play. Terri is concerned about the funding gap in later stages for these startups. Centiment is brain-powered advertising. Micah said that big companies are able to get away with what they are doing because their processes and perspectives are narrow. Centiment.io is scalable neurocomputing delivered by SaaS that can be used to provide responses as one would get in focus groups. They have an emotional search that takes the ideas and provides feedback as to what the emotional response will be. If Micah could wave a magic wand, he would change the definition of success. Once you change the definition of success, you can affect so much including how women perceive themselves and promoting opportunities for the American Dream for a larger group of people. Micah and Terri talk about what they have sacrificed, and the cost associated with pursuing ‘success’ as it is currently defined. Neuromarketing: Neuromarketing is a field that applies the principles of neuroscience to marketing research, studying consumers' sensorimotor, cognitive, and affective response to marketing stimuli (Wikipedia). Older PostEpisode 34 -Micah Brown and how he hacked the system to get ahead in business.